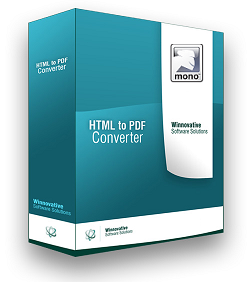 Winnovative HTML to PDF Converter Library for Mono can be integrated in any Mono application to convert URLs, HTML strings and streams to a PDF document, to a raster image or to a SVG vector image. The converter offers full support for HTML tags, HTML5 with CSS3, SVG and Web Fonts, page breaks control, media type rules, repeating HTML table header and footer, hierarchical bookmarks, tables of contents, fillable PDF forms, HTML with page numbering in header and footer. The library was designed and tested to work reliably in multithreaded environments and to completely release all the resources used during conversion after each conversion. This makes it suitable for usage in applications running a long period of time without interruption. The software package you can download from our website contains demo applications to convert URLs and HTML strings to PDF. The licensing model is simple and you can purchase a license online. A purchased license never expires, is royalties free and it includes free technical support and software update for 1 year from purchase date. Winnovative HTML to PDF Converter for Mono is distributed in a Zip archive. You can follow the link below to download the software. The Zip archive contains the client library you can use in your Mono applications, the HTML to PDF Server for Windows and for Azure and a console demo application. In order to use the Winnovative HTML to PDF Converter for Mono you first have to install the Winnovative HTML to PDF Server. The server was built on .NET library to extend its capabilities to other platforms and languages. The client library that you link in your Mono applications will connect to the server to convert HTML to PDF, to Image or to SVG. Winnovative HTML to PDF Converter Server can run either in a Windows Service on a Windows machine or in an Azure Cloud Service deployed in Microsoft Azure cloud. You can find detailed installation and uninstallation instructions in the Readme.txt file from the root of the downloaded package. The Winnovative HTML to PDF Converter for Mono API allows you to convert a HTML document to PDF in just a few lines a code. The programming interface is also very rich and allows you customize the generated PDF document in various ways. The code below is copied from the demo for HTML to PDF Converter that you can find the in the Demo folder of the software Zip package.